Here's Lucy, Lucy is N.G. as an R.N. Lucy is N.G. as an R.N. Lucy cancels her trip to San Francisco to attend a secretary's convention and play nursemaid for Harry, Kim, and Mary Jane, all at the same time in her home. Kim has the flu; Mary Jane breaks both of her hands; Harry gets a wrenched knee; and Kim's cat (also named Harry) has kittens. Special Notes: This is Roy Roberts (1900-1975) last television appearance; he passed away a year after this episode was filmed. 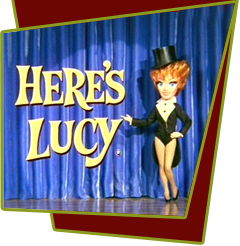 He became a regular on The Lucy Show in 1966, when he began portraying Mr. Cheever, the boss of banker, Theodore J. Mooney.